Improving Workplace Quality casts light on the most recent developments in the field of worker well-being with contributions from a number of disciplinary domains (law, economics, organization theory, sociology, etc.). A consensus has developed in workplace studies around the concept of ‘well-being at work’ in an awareness that such apparently distinct aspects as health and safety, discrimination, labour market integration, and work-life balance converge in the workplace and are best treated as one complex phenomenon. This important book provides an in-depth analysis of ongoing changes in the world of work and their impact on personal well-being. The contributors place specific workplace experiences in a comparative perspective, examining policy and regulatory initiatives and judicial rulings at national, regional, and international levels. This book covers an increasingly popular topic from various perspectives providing a detailed overview of recent developments in policy and jurisprudence regarding discrimination, work-life balance, and workers’ integration into the labour market – as well as a guide to best practices in promoting well-being at work. 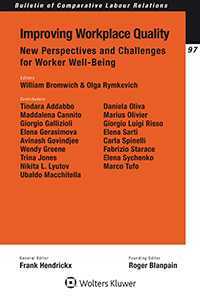 As a stimulus for further reflection in relation to innovative measures in the field of worker well-being, this book proves indispensable to labour and employment law practitioners, as well as to work organization, occupational medicine, mental health, and human resources professionals.